An event or meeting catered by Planet Sub St. Joseph — sounds awesome, right? 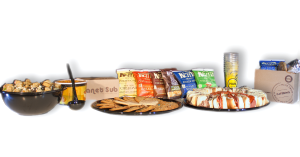 From corporate meetings and rehearsal dinners to backyard birthday parties and charity events, we offer catering for any gathering, large or small — and when you’re enjoying our catering, we guarantee you’ll taste the same freshness, flavor, and authenticity you expect from Planet Sub. Call Planet Sub St. Joseph at (816) 273-0611 to discuss our catering menu, or learn more about our catering services below! You won’t hear any complaints when Planet Sub St. Joseph caters your next event. We offer a delicious variety products on our catering menu, so you can create an order that is perfectly suited for your event. We are also happy to accommodate for all kinds of dietary restrictions — just let us know how we can adapt our catering menu to best serve you and your guests! Sub trays: choose any of our fresh-made sub sandwiches (one, two, three — as many types as you’d like!) and create your own catering sub tray. We cut them down to 4″, making them the perfect grab and go food for your get-together or meeting. Soups: order individual servings or a large soups for groups to feed 6-8 people. Ask about our seasonal soups to see what is available for catering. Salad trays: our tasty salads also come in catering portions. Choose from classic Garden, Greek, or Chicken Caesar — all complement our savory subs. Cookie trays: Who doesn’t love cookies! We’ll put together a sampling of our fresh baked cookie flavors to satisfy every guests’ sweet tooth. One bite and your guests will know who to turn to when they need catering. Gluten Free: Searching for low carb or gluten-free catering options? Psub has you covered! Options include our filling full-leaf romaine wraps, low carb tortilla wraps, and even homemade gluten-free bread at certain locations. Keep in mind that all bread served in our restaurants is 100% vegan, free of azodicarbonamide, never frozen, and made from scratch by hand each morning. Even when catering for large groups, we never cut corners to save time. Need fresh made food for your next event? Planet Sub St. Joseph has a catering menu to suit your needs. And really, who would say no to an event featuring Psub catering? No one you want to hang out with. 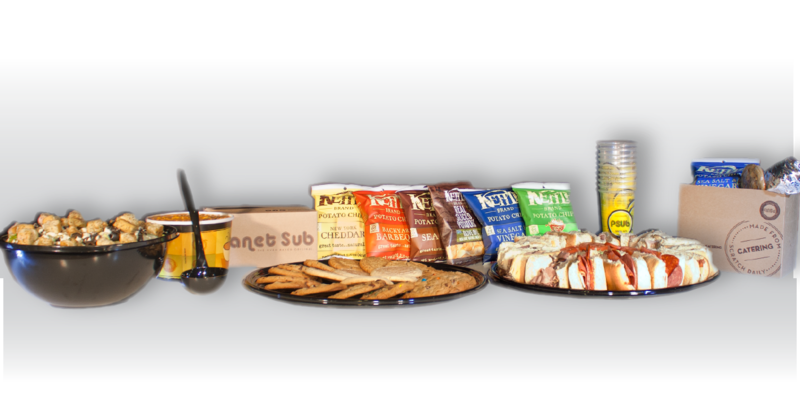 Call (816) 273-0611 to discuss your catering needs with Planet Sub St. Joseph.